This leg is one of the finest of the whole trail, although in bad weather you'll need to have your wits about you. As you climb back out of Inchnadamph, skirting Cnoc an Droighinn, you're entering superb mountain country. Crossing the corrie beneath Beinn Uidhe, you climb steeply again to a pass beneath Glas Bheinn before heading north east towards the Was a Chual Aluinn waterfall. You may find it helpful to have an OS 1:25000 map for this section as route finding can be challenging, particularly in poor visibility. A rough, indistinct path takes you down to the potentially difficult river crossing of Abhainn an Loch Big which you follow to Loch Beag and onwards, skirting the coast to Glencoul where there is a fabulously located bothy (NC 271 305). By this stage you may be ready to call it a day, especially as the climb up from Glencoul and around the Aird da Loch peninsula that juts into Loch Glencoul like the prow of a battleship is rough and taxing all the way to the bothy at Glendhu (NC 283 338). 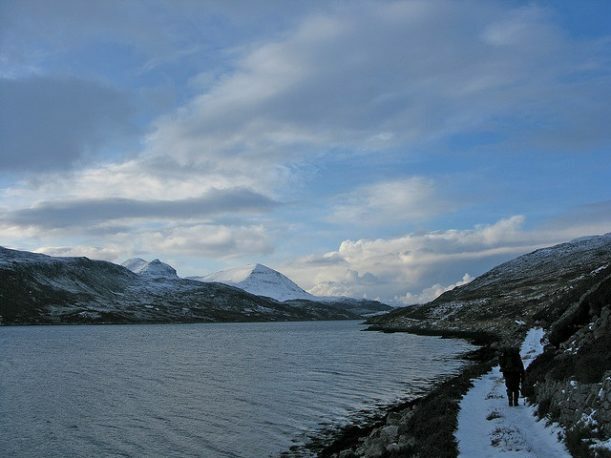 If you're feeling weary or want to steer closer to civilisation, you could follow the A894 north from Inchnadamph for a couple of kilometres to the famous Ardvreck Castle. Here a path heads north skirting Glas Bheinn, rejoining the road near Loch na Gainmhich. From here there's no real alternative but to follow the road north for 6km or so to Kylesku where there is accommodation. The road isn't particularly busy and the scenery is stunning, so this stretch of road is no great hardship. To rejoin the main route, head north from Kylesku before turning east at Kylestrome.